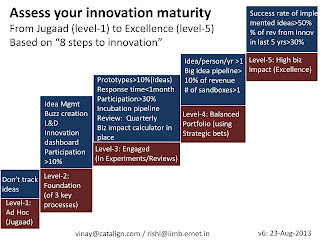 One feedback I and my co-author Rishikesha Krishnan have been getting in our talks/discussions is – Is there a way to assess where we stand on innovativeness based on the framework in 8-steps to innovation? That triggered us to create an assessment framework. In this article we present a broad outline of the framework and illustrate how organizations move from one level to the next in their innovation journey. 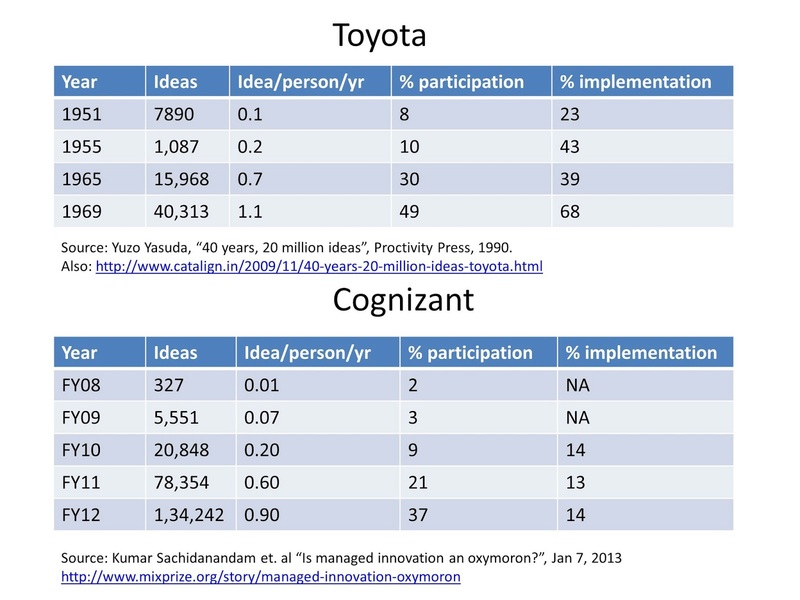 We will use publicly available data from two organizations: Toyota and Cognizant. We really appreciate the detailed accounts created and made publicly available by Yuzo Yasuda for Toyota and Kumar Sachidanandam for Cognizant. We hope more organizations follow the practice in future. From Ad-hoc to Foundation level: Level-1 called Ad-Hoc is no brainer – if you don’t track ideas in any form, then you are at level-1. To begin your journey from Ad-Hoc to Foundation level (level-2), you need to implement 3 core processes: idea management, buzz creation and training & development. However, to qualify you at the foundation level, you must get at least 10% of the employees to contribute at least one idea annually. This journey can take a few days to a few years depending upon the size of the organization. 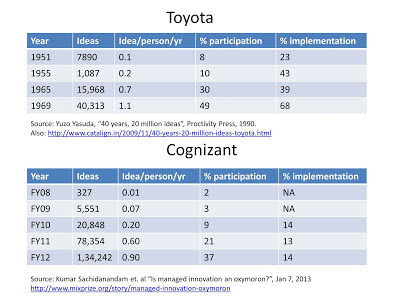 For example, it took Toyota 5 years and Cognizant 3 years to clear the 10% participation hurdle. In the early phase, most organizations emphasize idea management process and also organize trainings. However, the process which needs special attention is the buzz creation process. Apart from rewards and recognition, it involves things like organizing events, running campaigns, publishing newsletters, success stories and dashboards, building communities of practice etc. In Toyota it involved organizing exhibition of implemented ideas, field trips and changing the tone of the communication from a formal to informal. In Cognizant, it involved creating a set of champions who facilitated igniter sessions, identified problems, mentored idea authors etc. Moreover, it involved organizing innovation fairs in India (4 in the 3rd year) and outside India (11 in the 3rd year), publishing innovation journal from second year and organizing innovation summit from the third year. From Foundation to Engaged level: Level-3 is called “Engaged”. Getting 10% of the people engaged innovation activity is one thing. However, sustaining the engagement at 30% is something else. What are the people engaged in? People are engaged in various activities related to innovation, but at this point the two activities which matter most are experimentation and reviews. The metric also says at least 10% of the ideas should have prototypes created for them. Unfortunately, this data is not available from these organizations. However, we believe that creating a culture of experimentation is perhaps the most difficult aspect in this journey. For management, getting a habit of reviewing ideas / proposals and doing it effectively also takes time. For a services company like Cognizant, it may involve facilitation in getting a buy-in from customers. This is also a crucial phase when the treatment given to those whose ideas / experiments have failed sends a strong signal to everyone. If the organization can’t show tolerance for failure during innovation, it is difficult clear this level. For Cognizant, the 30% hurdle was cleared in 3 years since the program started. Note that another requirement to clear this level is to have business impact calculator in place. For Cognizant it was put in place in the third year. For Toyota, it took 15 years cumulatively to clear level-3 and 10 years after clearing level-2. Getting middle management engaged is usually a challenge. Toyota mandated that for the second round of review of selected ideas, it is not the idea author (typically a shop floor worker) but his manager present the case. A self-organized community of gold-silver-bronze medalists called “Good Idea Club” made a difference. From Engaged to Aligned: Up to level-3 (Engaged) the innovation program can run within a division or function. However, at some point it needs to enable differentiation for the organization i.e. it should align with the strategy of the organization and perhaps help create one. This usually means two things: One, there should be one or more innovation sandboxes with dedicated teams created within a few strategic constraints and experimentation should go from low-cost high-speed to low-cost high-speed and high-volume within the sandbox. Two, there should be a healthy big idea pipeline e.g. Total potential impact of the big idea pipeline > 10% of revenue. For most organizations it also means having a few specialists who can think deep within their domains of expertise. At Cognizant, creating a concept lab was a step in the direction. Specific focus areas were identified e.g. Text mining, Faceted browsing and Robotics and slowly expanded to include semantic web, big data analytics, autonomous computing, augmented reality etc. Note that idea per person per year metric is expected to be at least 1 to clear this level. It took Toyota 19 years cumulatively to clear this and Cognizant may have cleared it the current financial year. From Aligned to High Batting Average: This is the final and output centric level. Rate of success for implemented ideas especially for large impact ideas should be greater than 50%. We have borrowed this metric from what A G Lafley ex-CEO of P&G set for their innovation program. Similarly, it helps to see how much of current business comes from the innovations in the past 5 years. We have currently put 20% - similar to product vitality index of 3M which is currently at 33% and that of Eureka Forbes which is also at much higher than 20%. This is our current view and it is evolving as we talk to more organizations. I keep updating this post with the latest version of the assessment chart. If you have any inputs and/or need any help in assessment, please contact us at: vinay@catalign.com. Yuzo Yasuda, “40 years, 20 million ideas”, Productivity Press, 1990. Kumar Sachidanandam et. al, “Is managed innovation an oxymoron?” Jan 7, 2013.